A lot of Wizzley writers also show off their creativity on Zazzle.com. I'm simply the latest. I don't currently have a large collection but I do have a nice variety. From phone covers to dog collars, coffee mugs to birthday cards, I hope to make Kaits_Creations a fun store with items for all Wizzleyers, and gifts for their friends and families. Love is said to be the greatest and purest feeling a person can have for another. 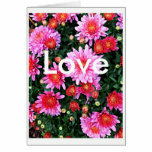 I took a picture of some really beautiful flowers and I thought they would look amazing written in "love," so voila! 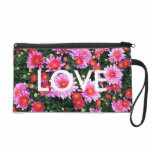 LOVE Floral Wristlet for multiple uses: a wallet, a makeup bag, or a discreet feminine care bag. 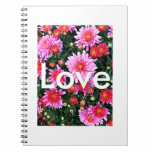 Love Notebook would be great as a diary, journal, everyday lists, or keeping notes for work or school. Corinthians 13:7 Love Card holds one of my favorite bible verses about love and would make a wonderful gift to a loved one. (Brooklyn accent required) "We got ya Birthday card, ya postcards, flowers, bees, cats- you name it, we got it." Happy Birthday Floral (blank inside) is similar to the "Love" card but written in baby blue is "Happy Birthday" to bring some contrast and pop of color while I kept the inside blank so you can write your own personal birthday message. "Missing You" Floral Postcard has that beautiful flower picture, that I obviously love to use. In soft cursive, "missing you" is atop the flowers. I chose that particular font because it reminded me of a vintage postcard. "Bee Seeing Ya" Postcard has purple flowers instead of pink, along with a pretty bee. I somehow managed to capture an awesome, big bee on some flowers and it made for really cute card. Zazzy Cat Eye Postcard is an awesome close up of my cats eye. He was sitting in front of a window on a bright day so the lighting was just perfect and it made a great photo. (Turn your head to the right when looking at the postcard image) I know a lot of people who love cats so this would be a really cool card to send to a fellow cat lover. Psalm 31:24 T-Shirt "Be Strong" has a really beautiful Bible quote "Be strong and let your heart take courage." The shirt comes in several different colors but I chose pink because I can see this being used for women with breast cancer, or just any woman who needs a reminder to stay strong. Other colors include black, white, grey, red, and hot pink. Psalm 34:18 Inspirational Tote Bag -one of my very favorite Bible quotes. (I've actually got this quote in my office cubicle.) "The Lord is close to the brokenhearted and saves those who are crushed in spirit." I thought it would very sweet on a tote so you can always carry some reminder of God's love. Both of these together would be a really sweet gift to someone going through a hard time, especially if you throw in the "Corinthians 13:7 Love Card" shown above. Psalm 31:24 T-shirt "Be strong." Flowers, bees, cats oh my! The same 3 photos as above made these really awesome phone cases. These are especially great gifts since practically everyone has a cell phone. The cases are available for iPhones 3-6, iPod touch, Samsung Galaxy S2-S5, and Motorola Razr. I love anything floral so the Bee and Flower pictures are super adorable on mugs. I was thinking of my moms dogs when I made the collar. The pink flowers are very cute and feminine for dogs of any size. It's available in small, medium, and large. Cat eye key chain for luck. I heard somewhere that cat eyes are lucky and if you believe it is, then why not? Out of this thinking, a key chain was created. Check out Kaits_Creations and if you see an image you like and want it transferred onto a specific item, just let me know. :) I hope you find something you like for yourself or as a gift to a loved one. Thanks for checking it out! Happy Holidays to all! KaitlynDeMetro, Klaus and Kol are photogenic and look like they enjoy putting their best paws forward! Thanks! I really should make a card out of that picture of them. Everyone seems to like them. Zazzle cards are of such good quality, too. I love your cats! He's only a year old. I imagine he'll get bigger as he ages. The little one isn't quite so little anymore. I think he's about 4 or 5 months old now and he eats EVERYTHING- any piece of food I drop, it's gone. When he's sitting on my lap I'll pick up his shoulders so he's standing and he's got such a gut. Your tabby is much thinner than mine. Thanks. I suppose I could make an actual poster out of my cats photo. They were being so cute that day.